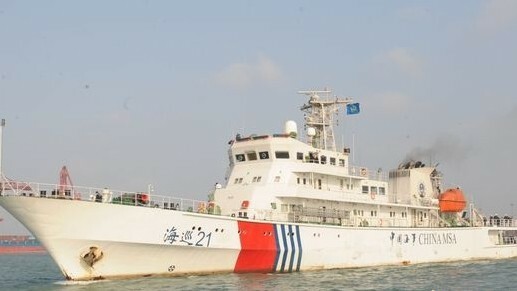 Hainan marine patrol ship Haixun 21 set sail from Haikou Maritime Base Wharf to the sea around Sansha on Jan.15, which is its first operation in the South China Sea since it was listed on the Hainan marine Board on December 27, 2012. In order to ensure the safe navigation of vessels, protect the marine environment and safeguard national sovereignty, the ship will set off from Haikou and patrol Yongxing Island, East Island, Bom Bay Island and Chenghang Island and then return Sanya Port. It will cover a distance of 600 nm. The law enforcement officers on the ship will investigate and gather evidence if they find any illegal activity in the area, and start a search and rescue operation if there are accidents and help is needed to save lives. With a displacement tonnage of 1,583 tons and an overall length of 93.2 meters, the ship Haixun 21 is widely regarded as China’s No.1 marine patrol ship.